I was on the forum earlier regarding replacing a windshield sprayer nozzle. I got that taken care of. 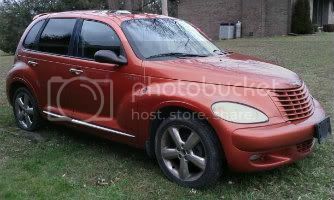 Now I ran into the problem of the hood of my 2006 PT Cruiser Touring Edition not closing all the way. When I close the hood, it catches something where the hood latches but you can wiggle the hood up and down still. It doesn't close completely. 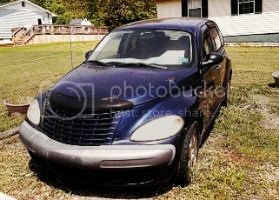 The hood release inside the PT Cruiser is loose. I'm going on a road trip tomorrow and it's been quite windy today. I don't want the hood somehow getting unlatched and fly up. 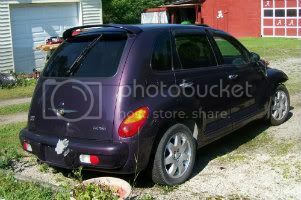 2006 PT Cruiser Touring Edition. have a second person operate the in-car latch while you stare at, and move the underhood latch with a flathead. if it does not move freely by itself, you may be able to free it up with WD40 or white lithium grease. if it does operate correctly, you might just need to adjust the rubber stops on the left and right corners of the hood. you can usually adjust the striker on the radiator core support by loosening the bolts. just be sure whatever you do ends up being a safe solution. a hood flying up is a really crappy reason to replace a windshield. If nothing has be messed with. No adjustment should be needed. You most likely have something stuck. Cable not retracting all the way back in. Holding latch open. After the safety latch is engaging you should be able to push down lightly and hear it latch. If only the safety catch is holding. Don't drive the car, wind or not. It will blow up at some point. Most likely causing enough damage to total your pt. Check the cable push it into the housing and lube the latch as rob said till you get it working freely. Last edited by Busted_PT; 18 Jan 2014 at 09:43 am. I'm with you on this ptprice! I will blow up at some point. Most likely causing enough damage to total your pt. It will blow up at some point. Most likely causing enough damage to total your pt. Oops pappa, that was supposed to be It not I. heehheehhe. Thanks for catching that. Don't want to scare anybody. I know what you meant, I just found it to be freaking hilarious. Kinda like that "don't do this or that to YOUR pt cause I don't like it" attitude I (along with others) get from other forums. I had an oil change done this past weekend and the mechanic was able to get the hood all the way down.